A life-long dancer, Ellen Cohen has been performing, practicing & teaching at the cutting edge of body-mind explorations her entire life. As a child, she was always dancing, playing or listening to music and singing. She added film to her artistic passions in college, folding them all into a communications/anthropology major. In her twenties, she studied intensively with Erick Hawkins, Twyla Tharp, Steve Paxton and Nancy Stark Smith. She belonged to and performed with a multi-media improvisation group in DC, as well as a tap company. As a Montessori teacher, she actively fostered the children’s artistic expression. She was an authorized Continuum teacher from 2006 through 2015. From her aesthetic immersion in the world of the soma, she brings to her performance, teaching & healing work a deep respect for the sacredness of the moment, the wisdom that can emerge from the unconscious, and the importance of the relationship between client and practitioner, artist and audience. 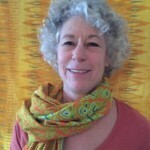 She has a private practice in the Philadelphia area as a body-oriented psychotherapist, drawing from a combination of body and energy techniques, including structural myo-fascial release, Muscular Therapy, Cranial-Sacral and Gestalt therapy. Her classes, healing work and creative expression are grounded in the dynamic fluidity of Moving Medicine, as Emilie Conrad called it. Within the first hour of my first workshop with Emilie in 1994, I knew I was home. I still recall feeling the sense of belonging: happy, interested, free. Finally the pure pleasure of my body’s movement and the texture of my sounds were considered relevant, important! I had learned in my dance training with Erick Hawkins that moving the way our bodies naturally function is not only safer, but could be beautiful. In Continuum, however, my body was the choreographer as well as the dancer! This intrinsic artistry is what inspires me to this day.